The manga by a man who previously wished to be a world class soccer player, and its long due animated adaptation wrapping up in the midst of the 2014 FIFA World Cup. Episode notes from Ping Pong The Animation. There is a lot of psychology that goes into playing games, both with friends and those who may become them. This applies to anything from physically vigorous activities like ping pong, to seated traditional ones like checkers, or modern video games from fighters to competitive puzzlers. Differences in skill and practice levels. How ones mind processes what is going on before them. The sorts of strategies they could choose to deploy. Not merely as a matter of creating decisive victory either. At times we have all perhaps drawn a game out or otherwise played down our abilities so that things do not seem as soul crushing to your opponent. After all, the goal would be to that one is above all else is playing for fun, and there is a degree of consideration for not wanting to coldly and outright destroy a friend each and every time. You would like to keep playing. And there is a lot of inner emphasis we place on that particular word in our own social experiences. Such is the situation of Makoto Tsukimoto, whose nickname is Smile out of general recognition that he rarely ever does, and his good friend since childhood Yutaka Hoshino, otherwise known as Peco. They are each members of their high school ping pong team, having played the game since they were kids under the tutelage of the chain smoking woman who owns a local table tennis dojo. Smile has the technical capacity to be extremely successful at the game, but has historically lacked the mental drive to follow up on executing his talents to their fullest and most devastating effect. Peco, by contrast, tends to have a very large opinion of himself regarding the sport, with his rise to team ace status built on various gimmicks. But he does not take care of himself all that well, routinely skips practice, and gets by on being a big fish in a little ping pong pond than consistent application and upkeep of his abilities. Given their status as high school students, they are rapidly reaching a crucial point of their lives. Where ping pong is right on the edge of being either a passing high school fancy to whittle away the hours with at the door to adulthood and the rest of their lives, or the potential for ping pong to become their lives. 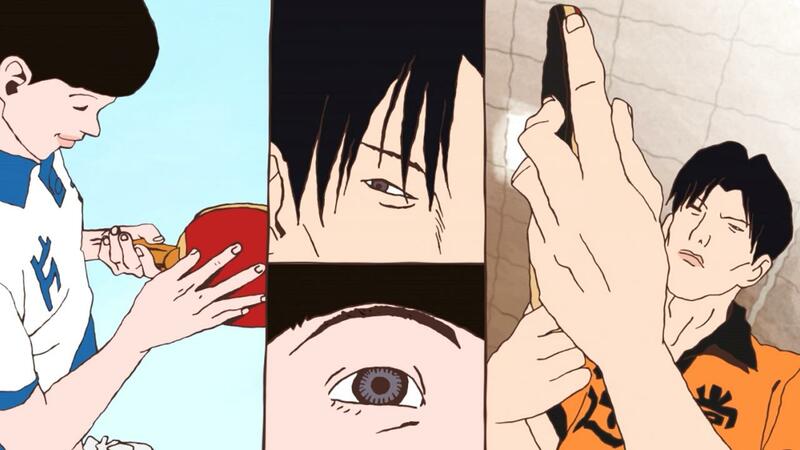 What has transpired over the years leading up to this, and what so much of Smile and Peco’s narrative threads are woven around, is a feedback loop has been developed over time. Peco has never felt a need to buckle down and really train and push for small, razor thin margins of advantage. His tricks, gimmicks, or brute force allowed him to skate by well enough and receive praise. He has also never faced near world class competition as the series begins, and thus lacks the reservoir of mental fortitude that may otherwise be expected of a player in his team position. Smile meanwhile seems to have had rather few friends growing up, and so in turn his bond with Peco is immense. As much as he may think his friend slacking off is not helping his game any, Smile also finds a lot of grounding in Peco. For a long time now, through Peco and their shared experiences Smile has found ping pong a fun activity to play with people. He prevented him, willinging or not, from turning into a ruthless machine of practice and benchmarks. But, at this crossroads in their lives, a lot of things can get wobbly. They are faced time and again with trying to figure out not just where they want to go next, but where tournament results allow them to go. As a sport, ping pong revolves around a small ball being volleyed back and forth at incredible speeds. Being so much as a few fractions of a millimeter off ones mark or swing is enough to result in anything from a ball being missed entirely, to a return going radically off course. Even accidentally finding oneself succeeding in the midst of the chaos they have created for their opponent. In those moments, the ball is the entire world, in more ways than one. This is not a thematic link forgotten by Ping Pong The Animation. As the larger cast is rolled out and slotted into the production, we meet all kinds. Manabu Sakuma, a childhood rival of Peco’s who has little natural talent for ping pong but has poured years into trying to compensate for that. Ryūichi Kazama, a victory at all costs captain of a very dedicated high school ping pong program and a star player on a level where he is featured in advertising for related products. Kong Wenge, an expatriate from China who was dismissed from his national team and tries in Japan to promote a tough outward image as a mysterious international X factor in spite of his inner feelings of failure and depression. As well as others, high school player and otherwise alike. There is a lot of extremely tight character writing at work through all of this. Characters see reflections of themselves in others, who they either dreamed they could be a bit more like or what they wish to avoid. How they struggle through the pressures of looming tournament events that seem larger than life, even on a youth event level, because they can determine so much about what options may exist next. What doors are open, or shut forever. The very real and understandable feeling that one only receives so many chances in high school for these sorts of things, and once that is gone it is not like one can hit a restart button on those years again. Not everyone is happy about winning either, while others achieve success and fulfilment through it. Some characters become angry and self destructive as result of losses. Others feel lost and alone. Characters impact each other very directly through their play, given the one on one nature of the sport as portrayed here (doubles are mentioned, but not much a part of the narrative). They see their goals and objectives slam into each other at dozens of miles per hour through something as simple as a tiny little white ball, struggling to communicate. In manga form, helmed in both art and story by creator Taiyō Matsumoto, Ping Pong ran weekly for a little over a year in Shogakukan’s Big Comic Spirits magazine, from July 1996 to August 1997. In collected formats, this has led to the series being bundled up initially as five volumes, then compressed as three, and now most recently with the airing of the animated version as two omnibus volumes. The character narratives and the way they play off each other do benefit quite a lot from such repackaging, given how instrumental they each become to their lives on this threshold between professional aspiration and ping pong being but a high school memory. There is a definite consideration that significant portions of this series likely would not have come across as boldly without Matsumoto, in what must seem like beyond a lifetime ago by now, having had his own aspirations for playing on a world stage sporting event. 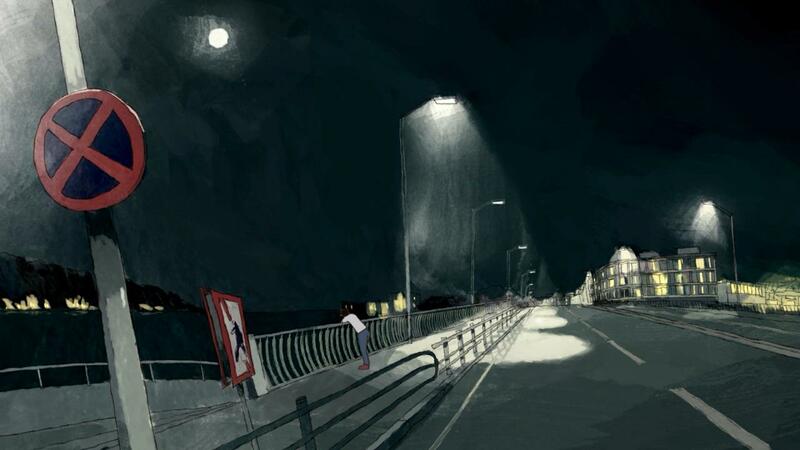 Despite being a multiple times over award winning manga creator, Matsumoto’s work is not very represented in animation. His work often relies on passionate and at times wild representations of motion, and tends to pick up descriptive modifiers like surrealist. The only previous released attempt being the 2006 Tekkonkinkreet theatrical film. As a 2014 television series, Ping Pong The Animation has eleven episodes to work with, and comes directed by Masaaki Yuasa. It is as perfect a match as could be imagined for the format. Yuasa’s own internationally renowned flair for being able to personally animate wild, morphing, free flowing line work as well as also assemble teams capable of both keeping to his very expressive directorial visions as they are able to express themselves through their art. This is vital, for a series that very much wishes to explore the ideas of sport as a fun leisure activity and sport as something that can become professional with the right circumstances. The narrative becomes greatly reinforced by Yuasa and his colleagues being able to have their own enjoyment portraying constantly shifting character bodies. Mental battles representing player personifications such as dragons. An individual who almost never speaks out loud. And indeed the incalculable exactly when everything in the world disappears and one is just playing a game with another. One kind of goal, and perhaps that which is the most important, would be for one’s profession to be something that can be both greatly enjoyable, with any global recognition that may come of it coming as an additional bonus. 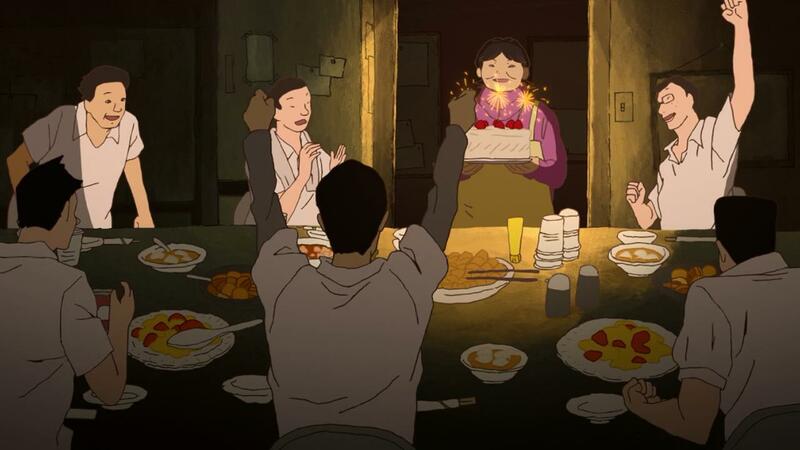 As a production, on every level, I feel Ping Pong The Animation embodied, demonstrated, and achieved the message and spirit of the drama it was tasked it adapt. It lends an air of further resonance and urgency to the implication that there are so many ways to enjoy success in life, even if your original plan does not pan out. After all, Matsumoto did not start off wanting to draw manga about ping pong. But here we are, and even years later his work is managing to touch more lives than he may have ever thought possible. 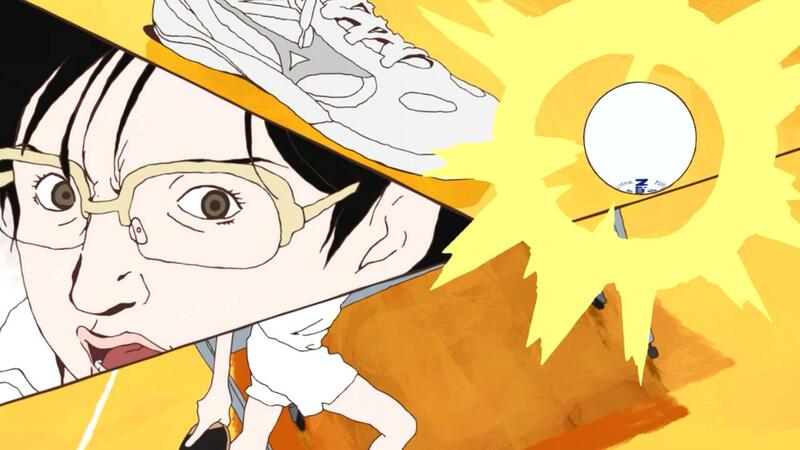 Ping Pong The Animation is streaming via Hulu, in addition to the official Funimation site.